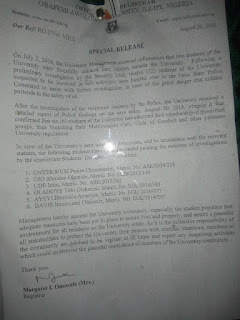 In its avowed commitment and zero tolerance against cultism and other anti social behaviors, the management of the Obafemi Awolowo University, Ile Ife, has suspended six students of the Institution who confirmed their membership of a secret cult. It will be recalled that on Monday, 2nd of July, 2018, an information was received by the University Management that two students of the institution, against their will, were forcefully initiated into cultism outside the University campus. Promptly, the security Unit of the University swung into action and, after a thorough preliminary investigation, twelve students of the University were apprehended and handed over to the Osun State Command of the Nigeria Police to assist with further professional investigation.